Photos from Chicago 03/10/2013 & new interview with Jared! Thanks so much to Chris Davis for the photos from Chicago! 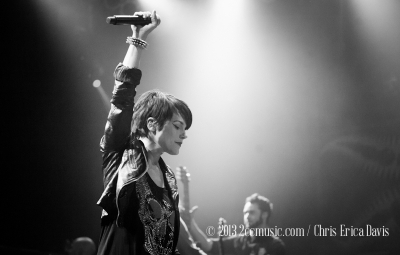 HHM: Seeing as this is Kristen’s first tour with Flyleaf what are some differences you’ve noticed in your live show? Hartmann: No one really knows who she is so it’s kind of like fans are seeing us for the first time again – it’s like they’re examining us and analyzing it in their head “Do I like this? Do I hate this?” but by the end of the night people are really excited and into the show by the time we start playing songs like “All Around Me” and “I’m So Sick” I think that’s been the biggest difference: they’re our fans but it’s kind of like they’re becoming our fans over again. HHM: Were there any challenges getting in sync with the new lineup? Hartmann: Well we didn’t practice very much before this tour and prior to it we had only played one show. It was like becoming a band again; trying to meld together – I think touring is going to be the best thing for that and it’s just getting better and better. HHM: How did you guys decide on Kristen as your new singer? Can you tell me a little about the process? Hartmann: Once Lacey told us she was going to step down we kind of secretly reached out to potential singers that we liked and auditioned a couple; Kristen ended up being a really great fit. Read the full interview at the source!